How to support the ICM? 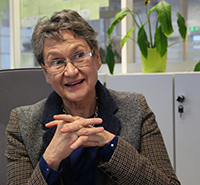 Ségolène Aymé, medical geneticist and epidemiologist by training, joins the ICM as part of emeritus status at the Inserm. She wishes to place her experience at the service of the ICM so that “search, find, cure” addresses in the best way to the 800 rare neurological diseases. She will carry out her mission at the Research Application Department to build the industrial offer focused on rare diseases. Ségolène Aymé is the creator of ORPHANET (www.orpha.net), reference website dedicated to rare diseases and orphan drug. She is also the founder and editor in chief of the Orphanet Journal of Rare Diseases. She chaired for a long time the European Commission Task Force for Rare Diseases and the “Topic Advisory Group” for rare diseases at WHO. APPLY FOR ONE OF THE TWO ICM POSTDOCTORAL FELLOWSHIPS!